In its 85-year-history, the Landmark Theater has hosted musicians like Jimi Hendrix, The Supremes, Marilyn Manson, even Elvis Presley.1 There have been the Broadway shows Les Miserables, Cats, The Lion King, and Wicked. The Landmark recently began a $50 million renovation project expected to last until 2013 that will modernize one of the biggest (and most lucrative) attractions in the city. 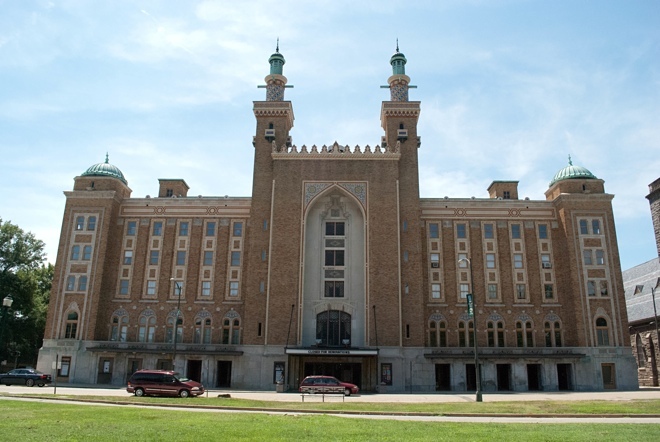 However, few know the origin and history of what some still call the Mosque and what will be called the Altria Theater: it was funded by Freemasons, served as an anti-aircraft command center during World War II, used by Richmond Police who built a shooting range in the basement bowling alley. And there’s much, much more. In 1918, Clinton Williams, potentate of the local ACCA Temple, wanted a grandiose building for gatherings of ACCA Temple members. The group, associated with the Ancient Arabic Order of the Nobles of the Mystic Shrine (AAONMS), were commonly known as “Shriners” (Shriners were not associated with Islam or a religious order; they were more or less a large fraternity). In 1872, the first Shrine Temple, the Mecca Temple, was built in New York City. Several other temples were constructed in subsequent years. Clinton Williams wanted one in Richmond. Over several years, architects presented Williams three designs, each one more elaborate than the previous. The final design was approved in 1925. The building would be 176,000-square feet with a 4,600-seat theater, 42 hotels rooms, a banquet hall for 2,000 people, a gymnasium, an 18 x 75-foot pool, a three-lane bowling alley, four billiard rooms, six lobbies, 18 dressing rooms, a roof garden, a kitchen and restaurant, and offices. The building’s exterior would incorporate Arabic aesthetics, just like other AAONMS buildings. The Shriners would name it the Mosque. The final cost would be $1.65 million. Construction began on February 7th, 1926. At that time, the city had no major performance venue. The only semblance of a city auditorium was an abandoned fish market on Cary Street–the biggest stage the city had. So to recoup building costs, the Shriners decided they would use the Mosque for public performances. Opening night at the Mosque was October 28th, 1927, the end of construction still several months away.2 By 1928, the Mosque would have two competitors: the Byrd and the Carpenter Theater. But the Mosque was only suitable for larger music and theater performances (and, of course, Shriner use). “It really was too much for film and vaudeville acts,” said Jay Smith, a spokesman for the Landmark Theater. As a result, the Shriners struggled with booking acts that could fund the Mosque’s operations. 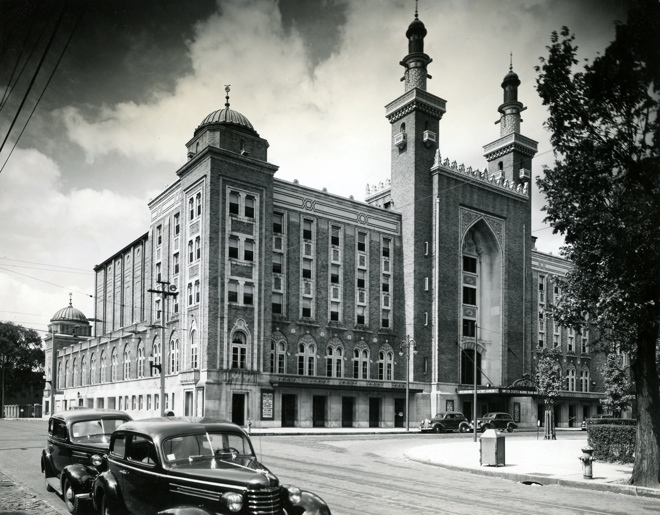 In 1932, during the Great Depression, Shriners went so far as to close the auditorium to the public so that they could save $14,000 in taxes.3 In 1940, nearly 15 years after paying $1.65 million to build the Mosque, the Shriners sold the building to the city for $200,000. 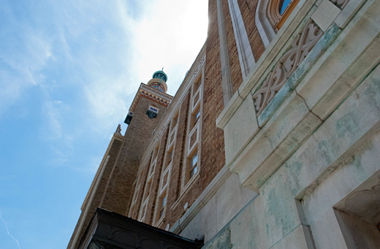 Since taking over ownership, the city has used the Mosque in several ways. In the 1950s, the Richmond Police used one the building’s two subterranean floors as a Police Academy. The Police converted the three-lane bowling alley into a shooting range for cadets (shooting was suspended during performances to not alarm theater goers).5 VCU held their class registration at the Mosque for several years until 1984. Timberlake Flag Co. once made flags on site. All the while, the nation’s leading performers and performances held court on the stage. New renovations will ensure that continues. Renovations over the years have reduced the original 4,600 seating capacity to 3,600 (yet the Landmark still remains the theatre in the city). The last significant renovation ($5.4 million) occurred in 1995, the same year that City Council voted to rename the building the Landmark Theater. In 2006, the loading dock and dressing rooms were expanded to accommodate large productions like Wicked and The Lion King. Despite these renovations, the Landmark has still had to take a Band-Aid-like approach to repairing the old building: fixing only what was necessary at the lowest possible cost. “The time has come to stop the patchwork approach and give the building a proper overhaul,” said Smith. October, 31st, 1981 • Iggy Pop performs on Halloween. Some fans are hit with thrown bottles. March 6th, 1994 • Frank Sinatra collapses on stage and is rushed to MCV. The singer discharges himself and returns to his California home on his private jet that evening. The current $50 million renovation ($14 million comes from the city, the remaining from private donations and tax credits6) will improve several components that audience members should easily notice: increased number of bathrooms with modern plumbing, better acoustics in the theater, improved lighting, more elevators, comfortable seats, and additional handicap seating. These and other renovations, said Smith, “will restore the Landmark to the same glory it had in 1926 when it opened.” Wilson Butler Architects will oversee the renovations, the Boston firm that handled renovations at the Carpenter Theater. Other planned changes include a “more grand marquee” as well as moving the box offices to the Main Street side of the building. These improvements will make for a better audience experience. There are also financial motivations to the renovations. The recent run of The Lion King brought in 93,000 attendees, a high percentage of which, Smith said, came from beyond city limits. The show’s run brought in $5.5 million in box office revenue, but its overall economic impact reached upwards of $16 million. Many of the attendees visited restaurants and bars and, some, traveling from out of town, stayed in hotels.7 “The city is benefiting from tax revenue,” said Smith. The renovations will compound that benefit. It’s expected that when renovations are complete, the Landmark will host 20 additional performances per year that will contribute to an additional 60,000 annual attendees. From that increased attendance, it’s expected that theater performances will generate an additional $6.1 million per year for the city. Put simply: the renovations will mean that both the Landmark and the city will make even more money than they already do. Some of this added profit will fund the local arts scene. A part of the CenterStage Foundation, the Landmark is connected with the Carpenter Theater. As part of the latter’s renovations, the 200-seat Gottwald Playhouse was installed in the theater’s Dorothy Pauley Square expansion. “Bring acts from around the world and around the corner” is CenterStage’s artistic mission, said Smith. The Gottwald shows independent performances that wouldn’t be shown in the city’s larger venues like the Landmark. Smith said that success at the Landmark will help bring these smaller plays to the Gottwald Playhouse. 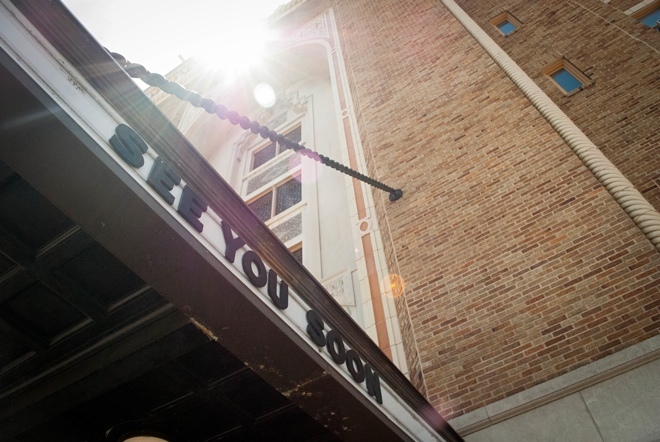 Increased profits at the Landmark means more money for smaller, independent theater. “They are very tied together,” said Smith. Ultimately, financial success will help lead to cultural success in the city. That is what CenterStage hopes to accomplish with the Landmark renovations. Don’t suppose anyone has pics of the billiard rooms back when it known as the Mosque? Would still make a wonderful area for a rooftop garden. The park and churches so near. They could do something similar to the Met up in NYC. What are plans for the Wurlitzer theatre pipe organ, still in its original state of installation. It is one of a handful of such rare instruments. It too should be preserved and properly maintained as part of the renovation. I waited 12 years to see the Lion King but finally got tickets a couple years back for the Norfolk performance. I wish i’d known then that within a year i could’ve saved myself the travel and been able to see it right here at home. What a terrific story on such an architectural marvel ! In what year, late 1960s, were all the seats and drapes stripped out for refurbishing?